Google Apps allows businesses and corporations to host Google products in the cloud under their own domains, for their employees. If you’re like most corporations, there’s a good chance you’re using a mail product called Microsoft Exchange at the moment. Your own network usually hosts Exchange on servers owned by your company. It gives the companies full control. It allows employees to log in to Gmail with their company e-mail addresses and receive all their company e-mail, calendars, and contacts in the Google interfaces they’re most familiar with. It gives employees powerful Google search capabilities to use on top of all that data. You can limit messages to just company employees. If you want to keep your conversation private, you can use Google+ just as you would some of the other popular enterprise social network tools. You just add your company domain as a circle and don’t specify any other circles. When you select your domain, the message you post to that circle is visible to all your fellow employees — but to no one else. 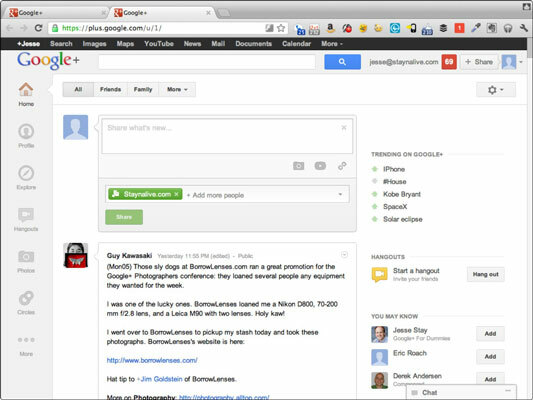 They will see your message in Google+, next to all the public people they have circled. They can narrow down to just your company and view updates from your company. You can include public lists in conversations you’re having with your fellow company employees. When you add any of your circles to your company domain, both the employees and the public circles you specify can see your update. This feature is great because it gives you a way to bring customers (or other focus groups) into conversations you’re having behind your firewall. You can do both your public and private communication all in the same interface. You can integrate with Google Contacts. The same deep integration you can get with Gmail and Contacts will work with company employees through the Mail product that comes with Google Apps. This enhances the corporate conversations you have behind your firewall by showing you who you’re talking with in Google Apps Mail and giving you opportunities to follow them. It also allows you to organize conversations between employees.